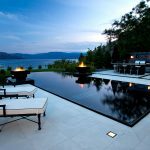 The breathtaking view of a pool with an infinity edge is an alluring addition to any backyard or outdoor living space. We specialize in the architectural design and construction of infinity pools in Dubai. What exactly is an infinity pool? When you are inside the pool, the water seems to go over the edge, constantly ‘disappearing’ into infinity, often merging into the landscape. You don’t feel that you are ‘bound’ inside a swimming pool as the pool seems to have a feeling of infinite space. From outside, it is a wonderful water feature with water continuously flowing over the sides into a channel. An extraordinarily designed infinity pool edge projects the visual effect of water vanishing or extending into the limitless horizon, as there are no visible edges on one side of the pool. An infinity pool will sometimes be referred to as a zero edge swimming or overflow pool because of the visual effect created as the water spills over an edge into a reserve that pumps it back into the pool. 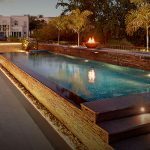 Our custom designed infinity pools offer a unique alternative to the traditional above ground pool. We offer many enhancing options for your designed infinity pool. Exquisite features such as lighting, waterfalls, fire pits and barbeques add to the design of any infinity pool. In addition to these options, there are many decorative touches to choose from, including pebbles, polished marble or quartz aggregate finishes. The infinity pool is designed to maximize your outdoor living space, with its own customized shape, size, and design. Offer your infinity pool a design that can transform even the least scenic space into an exotic oasis. Infinity pools appear to simply drop off into the horizon on one or more edge – seemingly extending into the horizon. Placed towards the house offers a wonderful scenic appeal. The beautiful scenic view can be enjoyed long after you’ve retired from your relaxing swim. The “vanishing” edge of your infinity pool turns the whole pool into a sort of mirror for its surrounding scenery that drops off into the horizon. The result is a lovely horizon effect that appears to extend limitlessly into the distance. Optimizes this pool for a child friendly and safe design. Infinty pools are ideal for any individual with a family with young children. Allows for different levels to optimize the surrounding landscape. Adding a raised deck can add another level to your design, ultimately elevating your aesthetic appeal. Aside from working with you to create a pool design that is tailored to your needs and budget, Milestone offers an in-house warranty, exceptional customer service and the most cost-effective pricing in the Dubai pool market. Our staff is readily available to answer any questions and to assist in turning your dream pool into a refreshingly cool reality. Contact us today to schedule a consultation to discuss the design of your new infinity pool and to learn more about our services.